Whenever a runway show takes place at New York Fashion Week, a story is being told. 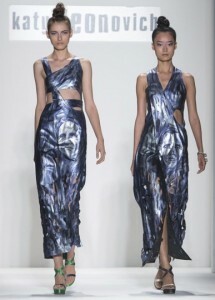 For the Katya Leonovich Spring 2013 collection debut, this story conveys a delicate woman with a strong statement that demands to be seen and heard. 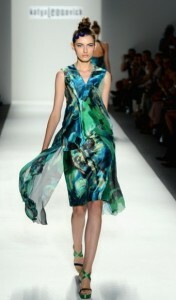 Nevertheless a gentler shift from past seasons, the line was feminine with some porcelain doll edge. This collection is made up largely of grey hues, sharp diagonal lines, and asymmetrical shapes. Butterfly cap sleeves, chiffon vests, and taffeta tops, graced the figures of the runway with tender intricacy. Metallic shades of blue, green, purple, and peacock coloring perfectly accompanied the grey hue theme of the line. Skin revealing holes have been a major component to the collections shown at Fashion Week thus far, and Kayta Leonovich’s line was no exception. The models’ hair were adorned in high and tight buns paired with natural-looking make-up, saving the dramatic presence for the couture. The headbands by Jenny Dayco and shoes by Andrew Kayla could not have complemented the dresses better. No runway show should be without a memorable grand finale, and Katya Leonovich did not disappoint. The final pieces to strut down the runway were two models- side by side- wearing the two faces of the Presidential election this November: Barack Obama and Mitt Romney. With so much passion and complexity to this line, it is no wonder that things also got a little political. The Katya Leonovich Spring 2013 collection was met with inspiration and awe. It emphasized the blurred lines for what separates the Spring from the Fall- cool tones are no longer reserved for cool months. Katya Leonovich undoubtedly turned up the heat with cool, in more ways than one. loving this collection – thanks!